New Mexico is just not a big city kinda place. Even Albuquerque is more like an oversized town. 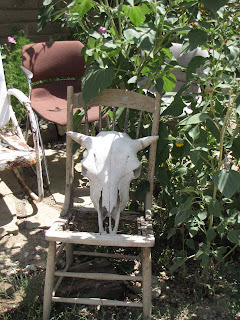 Once you head North toward Santa Fe and Taos, you find a lot of towns dotted throughout the hills, many of them little more than dents in the road. Truchas is one of those dents. The Truchas Farmhouse is an Inn that my mom fell in love with about 20 years ago. She makes a pilgrimage there every year, usually in August, just when we're starting to feel completely fed up with the heat in Phoenix. Mom loves the farm and the little casitas at the Inn, but she especially loves the lady who owns the place, Frutoza Lopez. Frutoza possesses a rare wit, and she and Mom like a lot of the same novelas (Spanish-language soap operas) and a lot of the same old Mexican songs. 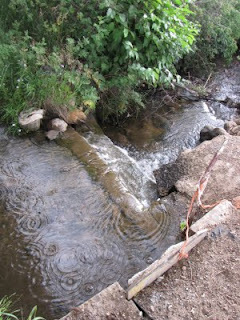 Truchas was the inspiration for Siggy Lindquist's home town, in my novel Broken Time: the rugged hills, the streams and irrigation gates, and the little towns denting the roadside. 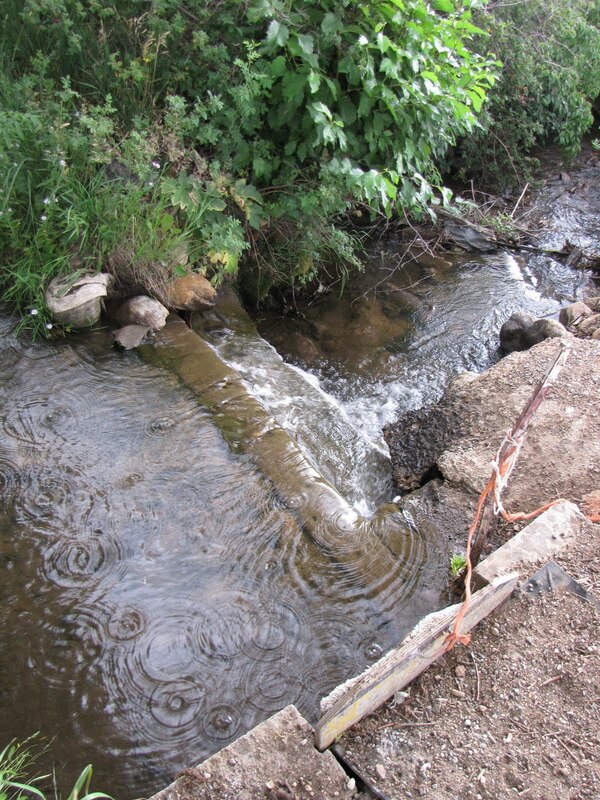 The Farmhouse has its own stream, which passes under a bridge in front of the main house. It also has a man-made pond out back, with at least two resident racoons – I surprised them this year when I trudged out with my camera and suddenly spotted them near a culvert. They disappeared into the pipe as quickly as they could. Unfortunately, I couldn't capture them on video. From the Inn, Mom and I venture out to surrounding attractions. 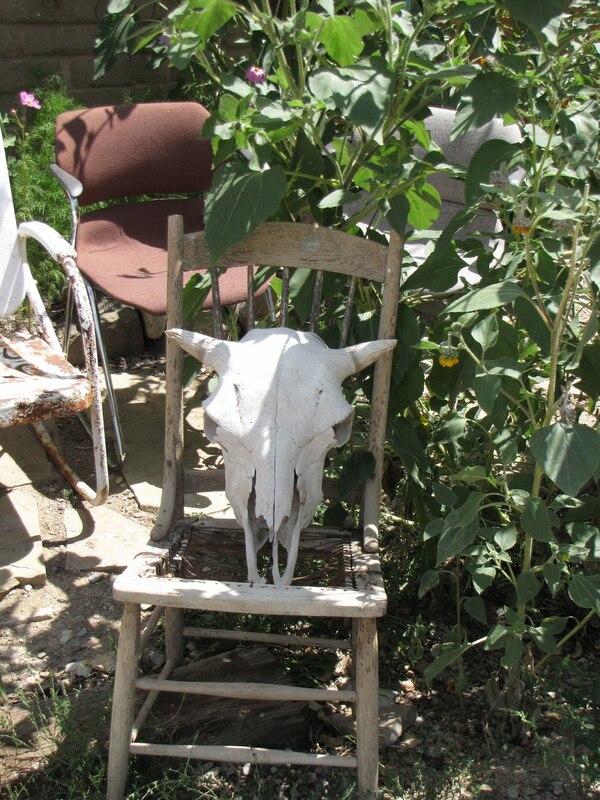 We've got a couple of favorite shops we like to go to, but they're not the expensive galleries and clothing stores that took over Santa Fe and Taos. They're thrift shops, where the fancy stuff gets sold second hand. 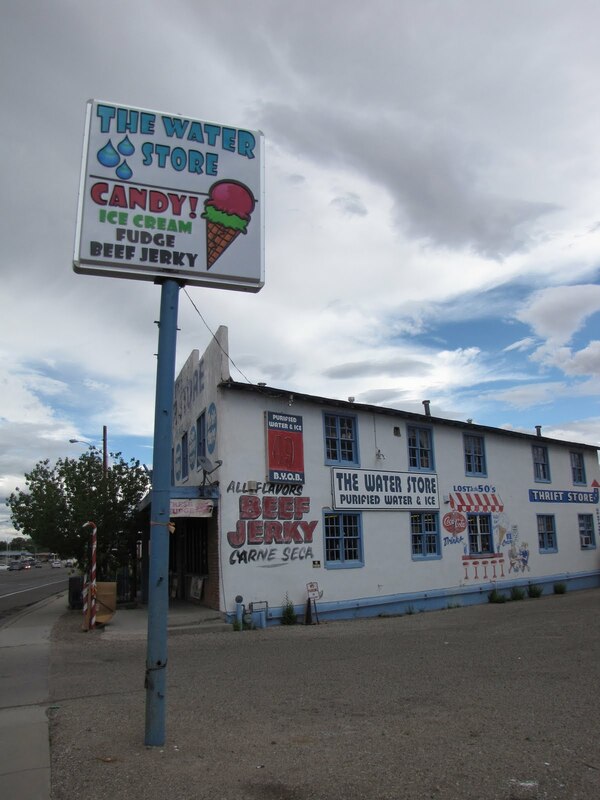 One of them is the second floor of a candy store in Española; items there run from 50 cents to $1.75. There are state and national parks to visit too. If you drive along scenic route 14, you can see outcrops of tilted layers of welded tuff, superheated volcanic ash that fused into solid rock. 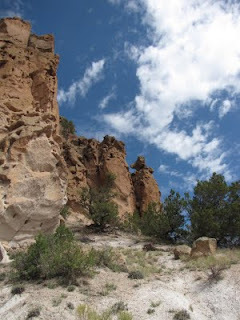 Turn off the route into Cerrillos, and you can visit Cerrillos Hills State Park, which features several moderate hikes through a landscape of welded tuff & volcanic rock, scrubby trees & tough grasses. 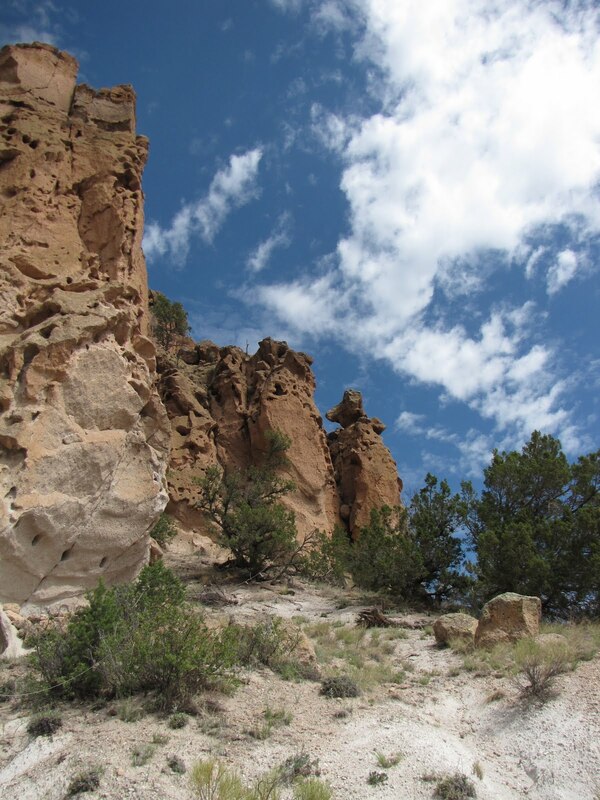 My favorite is Bandelier National Monument, below the Jemez volcano, which formed along the Rio Grande Rift. Jemez exploded twice within the last million years, spewing about 50 cubic miles of ash and rock. Bandelier National Monument is in Frijoles Canyon, which eroded out of thick layers of rhyolitic tuff, some of the same stuff you see along Route 14. The Canyon walls are tan, white, pink, and light orange, full of holes from gas trapped in the tuff that cooled and eroded into fanciful shapes. This fused ash formed a rock that ancestral Pueblo people found very useful for building material, so the monument contains ruins and petroglyphs too. This year, forest fires in New Mexico forced park officials to close all but a tiny portion of Bandelier. We didn't get to hike our favorite trail. But that just makes us more determined to come back next year. Mom lived in Santa Fe when she was a little girl, some time during the early 1930s. It's changed so much since then, I think it breaks her heart a bit. Taos has changed too. Even I feel some of this sadness – when I was growing up in Arizona during the 60s, we only had about one quarter of the population we have now. Crappy apartment and housing complexes have sprung up everywhere, ticky-tacky places that are poorly built and crammed close together, and that all look alike. Beautiful hills and mountains have cities and towns creeping up their sides. This is not an improvement. But we still manage to find the beauty in New Mexico every year. Mom will keep making her pilgrimage, and I'll keep tagging along. It's true that you can't go home again. But you can certainly visit from time to time . . .
My husband makes up really great titles for things. If you were looking at a display of his art in a museum, you would have as much fun reading the titles as you would have looking at the actual art. But unfortunately for Ernie, he's married to me – and I like to make up my own titles for his work. Take Ernie's Robot. I found him lurking in a forgotten portfolio. I like him so much, he sits in a prominent spot in the room where we spend most of our time. I see him every day when I wake up and every night before I go to sleep. He is there while I'm watching movies, while I'm working on our big desktop computer, while I'm folding laundry and putting it away. I meditate or vegetate under his glowing gaze; he watches me do my homework. 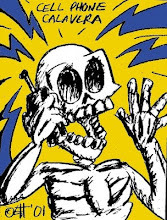 He has witnessed hundreds of phone conversations, but he never repeats anything he's heard. The Sphinx Lady presides over my science and travel library. She is so gorgeous, she would probably sell pretty quickly in an art show. But I suspect many who admire her obvious attributes do not suspect the appetites that are the flip side of her sublime expression. Skeleton Guy is an illustration for an article Ernie did for a gaming magazine, DIFFERENT WORLDS, about precolumbian monsters and spirits. If you see him, you have to be courageous enough to grab his exposed, beating heart, or the sight of him will drive you mad. I always thought he would make a great Halloween card. 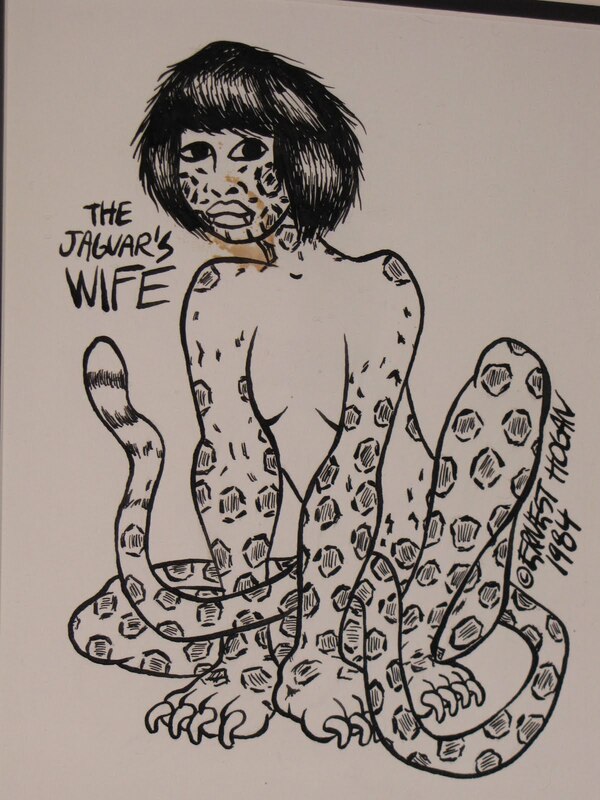 We weren't careful enough when we stored The Jaguar's Wife and something stained her face. But I rather like it – she looks as if she just got done eating a chocolate ice cream cone. After all, it's not easy to hold onto a cone with your paws. Ernie named this picture Cease And Desist – I call it Zeppelin Woman. I love the little chubby spot around her navel. I have no doubt she'll fight off the bad guys. Here are some details from The Novel, a piece that I hope to have mounted and framed some day. You can read it from either direction. Ernie did it on a whim, with some leftover particle board. It has suffered some damage over the years, but I love it anyway. The Crocodilian is still loaded with personality, even though he's dead. He's from one of Ernie's on-the-run sketchbooks. Ernie has kept several over the years, drawing in them with crayon and/or grease pencil. Happily, he has begun to scan some of this stuff into our computer, where he can work on it with the GIMP program. These sketches are some of his best work. I have appropriated many drawings by Ernie to illustrate my blog – it's one of the perks of being married to an artist. Fortunately for me, Ernie is a kind man, gifted with infinite patience. We have even begun to do some art together, using my photographs and his skill with GIMP. 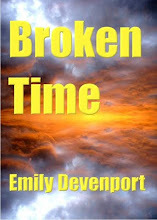 Together, we designed the cover for my book, Broken Time. We'll be doing more of this in the future, so . . . They've Got The Horizontal AND The Vertical . . . I grew up in Phoenix, Arizona during the 60s, a time and place that I fortunately shared with the wonderful program director for Channel 5, who was a huge movie buff. His programs on Channel 5 included, The World Beyond, Tarzan Theater, John Wayne Theater, Charlie Chan Theater, Adventure Theater, and many others. Each of those programs had wonderful theme songs. For The World Beyond, it was an excerpt from Also Sprach Zarathustra – not the most obvious bit, but the weird stuff with all of the voices that you hear in the movie 2001. 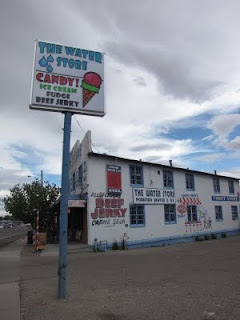 For John Wayne Theater it was an excerpt from the last movement of Grand Canyon Suite. That program director just seemed to have a knack for picking 30 seconds of music that captured the spirit of the movies he loved so well. He understood how important that music was. He is the one who taught me to be aware of musical scores. For me, the film score is always at least as important as what's happening on the movie/TV screen. Sometimes it's more important. Here are some movie and TV scores that rocked my world and blew my mind. I hope they'll do the same for you. I consider myself very lucky to have seen the premiere episode of The Outer Limits: "The Galaxy Being." But the really lucky thing was that I was only 7 years old, so when the announcer said, "Do not attempt to adjust your television set . . ." I was literally reaching for the dial. I snatched my hand back, scared motionless. "We control the horizontal," said the announcer, "We control the vertical." Oh my gosh! They've got the horizontal AND the vertical! We're doomed! So for the next hour I was a happy captive, utterly convinced that what I was seeing was the truth. But even more important, I believed the music, though I didn't know the mechanics behind it (and still don't). 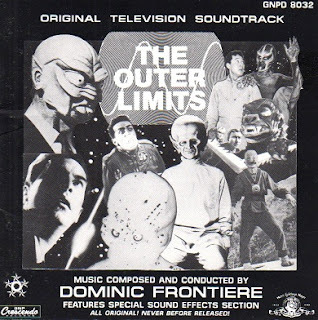 The music is utterly true, even though I now understand that The Outer Limits was just a very good story-telling device, not a transmission from benign-yet-spooky aliens. Dominic Frontiere belongs to the Great Soundtrack Composer Club, where he sits right alongside Bernard Herrmann and Elmer Bernstein (not to mention Igor Stravinsky and Aaron Copland). The day after I had my visit from "The Galaxy Being" I rushed out to tell my friends about it, only to find that many of them had experienced the same thing. If you're younger than me, maybe you'll find this goofy. But sample the music – you'll find out it packs a wonderful punch. I'm so glad I own a copy of this album. In the interest of preserving peace in our home, my mom gave me my own little black & white TV when I was 9, an act that some might consider a blow against Western Civilization. 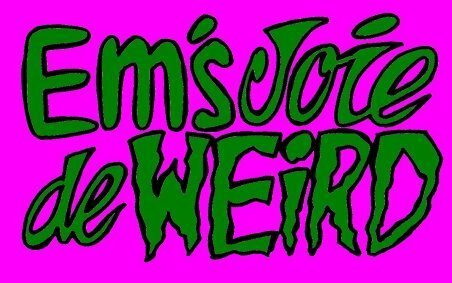 But I was a weird kid, and I didn't spend much time watching game shows. I was hooked on movies, so Bill Thompson's Channel 5 got a lot of my business. We also had a good local PBS station, and that's where I discovered Jean Cocteau's Beauty And The Beast. I accidentally tuned in during the scene where Beauty is running through the Beast's castle, a haunting, silent sequence that runs at a dreamlike pace. 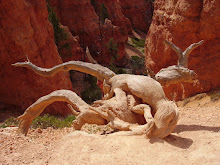 Then the Beast steps out of the shadows and confronts Beauty. She faints, and the music starts up again. Any thought I had of changing the channel was forgotten. When I started collecting albums, I searched for this soundtrack. 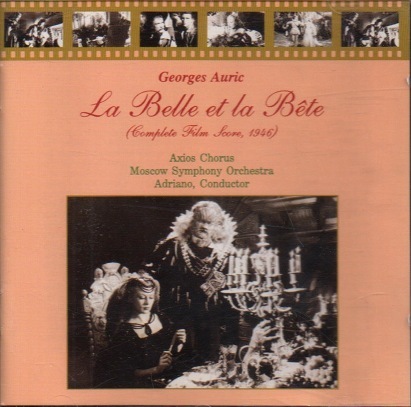 My search lasted for 30 years, because Beauty And The Beast didn't have a soundtrack album. It wasn't until after the death of the composer, Georges Auric, that someone was going through his papers and found the score. Now I own two different recordings (this one and the NAXOS recording). The score works both as a soundtrack and a classical suite. 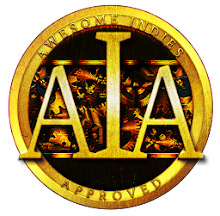 In turns it's haunting, romantic, heartbreaking, playful, transcendent, and triumphant. You'll like it even if you haven't seen Cocteau's film - and if you have seen it, hearing this music will evoke wonderful memories. It's impossible for me to imagine this film without its score, and that's the reason I won't see the remake. It's bad enough they thought they could replace Michael Rennie. But when I think of the wonderful sequence, “Nocturne/The Flashlight/The Robot/Space Control,” I can't imagine why anyone thought they could improve perfection. This sequence is the essential science fiction experience, an encounter with the unknown (and possibly the unknowable). 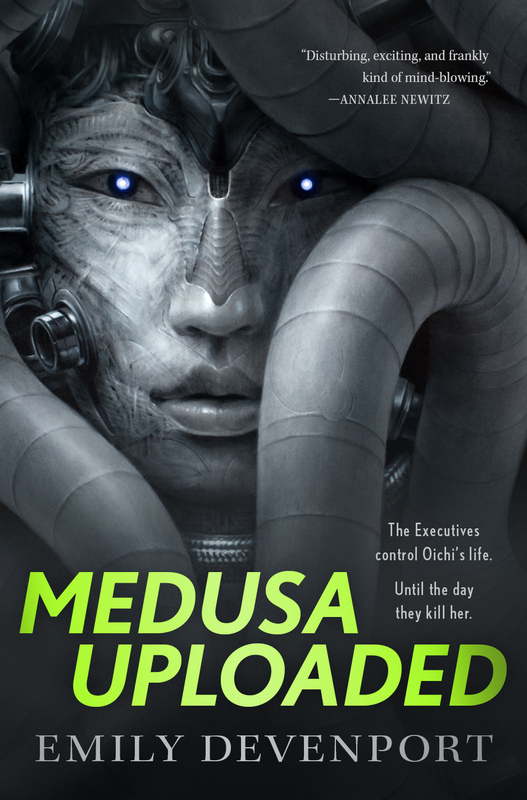 It's a glimpse into alien minds and alien machinery. 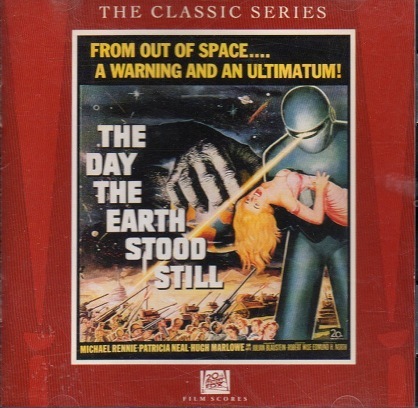 The theremin (played by Samuel Hoffman and Paul Shure) in this movie produced a sound that became the standard “science fiction soundtrack,” at least in the popular imagination. But it was never used to better effect, and it was beautifully supported by an orchestra in Herrmann's score. It's inventor, Leon Theremin, was a genius with a long and very odd career. 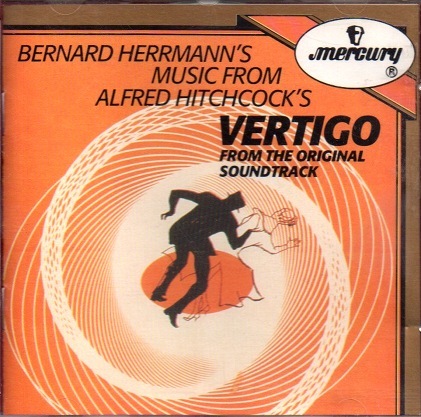 Bernard Herrmann went on to write scores for Alfred Hitchcock, including the next album. The first time I saw this movie, I didn't actually see it. I heard it. It was playing so late at night, I was dozing on my bed when it finally came on the TV (which tended to be on, much of the time, in my bedroom). The music roused me from deeper sleep, and managed to keep me in an in-between state for the entire movie. Occasionally I would pry one eye open and see Jimmy Stewart and Kim Novak, talking, running, kissing. I knew some heavy-duty stuff was going on. And even though I didn't hear the dialog, the music told me everything I needed to know about the movie and its themes of love, obsession, deception, and ultimate loss. This was the most grown-up movie I had encountered up to that point. It's so grown-up, I'm not sure you can truly comprehend it if you're under 40. But that's okay – the music is a road map. If you've heard it, you'll never forget it. It will tell you exactly how Jimmy Stewart's character was feeling. You'll be swimming in deep water. And that's an experience everyone should have at least once. Herrmann was a versatile composer who is probably best known (in the U.S., at least) for his score for Psycho, in which a band of crazy violins duke it out with some relentless cellos. The sound bite everyone knows (“scree-ree-ree-reet!”) doesn't really do the score justice. Listen to the whole thing some time – it's a masterpiece of suspense. Brits may know Herrmann better for his scores, Anna And The King Of Siam and Fahrenheit 451. These scores are so beautiful, they deserve blogs of their own. I saw these movies eventually (happily, when I was still a kid, and my sense of wonder was still dominant). But the first Herrmann score I ever heard was Jason And The Argonauts. The opening sequence is driven by the same sort of drum you would expect the rowers to hear on the Argo. Likewise, the horns might have sounded from city walls, warning of an approaching army or celebrating returning heroes. But my favorite part is where the dragons teeth are sown, and the Children of the Hydra sprout into an army of skeletons. I'm pretty sure the dominant instrument in this sequence is the bassoon. It's effect is delightfully menacing. Once those skeletons start fighting, an array of percussion instruments join the wind section to create the effect of clashing swords and rattling bones. Ray Harryhausen's animation and Bernard Herrmann's orchestration make a dazzling team. Someone (on NPR, I think) once posed the question: “What are the five album that changed your life?” For me, that mostly happened before I was 12 years old. The only exception is the music of Ralph Vaughan Williams, which took my heart by storm when I was 30-something. When I was a kid, the first album I became aware of was Snoopy And The Red Baron, by the Royal Guardsmen. I loved Snoopy, so it was only natural I would love the song about him. It's a wacky album, very British 60s pop/rock. But within a few years, my tastes became more sophisticated. Some new albums came along and rocked my world: Ports Of Paradise (Ken Darby and Alfred Newman), Rogers and Hammerstein's The King And I, and Jean Prodromides' score for Le Voyage En Ballon. 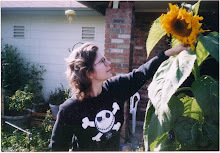 My mother, brother and I had seen the original version of Le Voyage En Ballon at a drive in. It was French, but didn't need subtitles, because it had no dialog – it was made by the same director who did The Red Balloon (Albert Lamorisse). The action and music told the story. Later, Jack Lemon bought the American rights and released the film with an awful narration track attached to it. My mom loved the music, so she bought the LP. I played it to death. This is another album I searched for, for years, in CD form. I recently found it on amazon – as an import. I can't stress enough to you – get this album while you can. It's incomparable. People have a tendency to romanticize times that are past, as if all adventure, glory, and achievement are long dead. I don't believe that's the case with film scores. People are still writing great ones. But today's composers are influenced and inspired by the composers who came before them. So am I.
I'll always be grateful to that program director for Channel 5. Every Saturday morning, he invited me to The World Beyond. On that show, and others, I heard some of the best film scores ever written. I was a very lucky kid.